Extraction of tooth or teeth, or other important regions plays an important role in identification and diagnosis of diseases. Machine learning techniques, specifically clustering techniques, have contributed actively for preparing model and using it for segmentation. 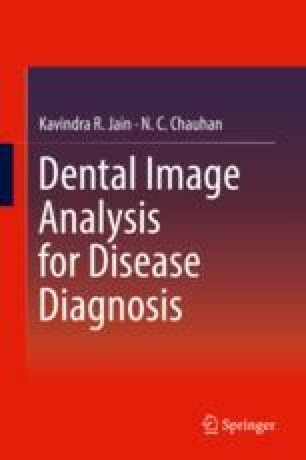 Some popular clustering techniques like K-means, fuzzy C-means (FCM), and other advance clustering techniques have been investigated in this chapter in this chapter for segmentation of dental radiographs. Clustering can be viewed as the most promising unsupervised learning methods. In this chapter we have evaluated three clustering methods, namely K-means, fuzzy C-means and Kernel-based fuzzy C-means for dental segmentation of dental radiograph. FCM is used for more than one clustering, and KFCM K-means, FCM and KFCM are used for non-mapping clustering. Moreover, KFCM overcomes the demerit of FCM technique. Validation of segmentation is not the prime requirement for diagnosing the problem in radiograph; rather, the accuracy, precision, recall, error rate, specificity and, most importantly, reduction in computational speed of segmentation, as well as decrease in amount of manual interaction are major parameters to be considered.